Hercules was very tolerant and trusting during his hospital stay despite his horrific injuries, according to veterinarian Amy Zahn, who treated him and later adopted him. 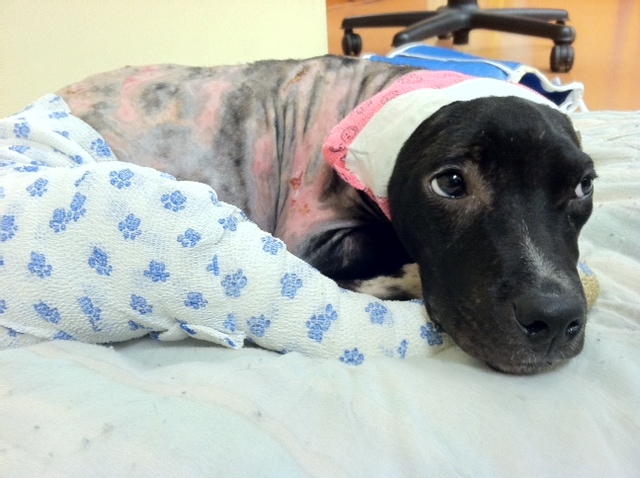 A little over a year ago, Hercules was found severely burned in a North Philadelphia neighborhood. He was the fifth dog/cat in four weeks to be set on fire. Unlike the others, Hercules survived thanks to treatments by a team of experts from the Animal Alliance of New Jersey and Crown Veterinary Specialists. One of the veterinarians who cared for him also adopted him and he is now fully recovered and living with a family that loves and cares for him. 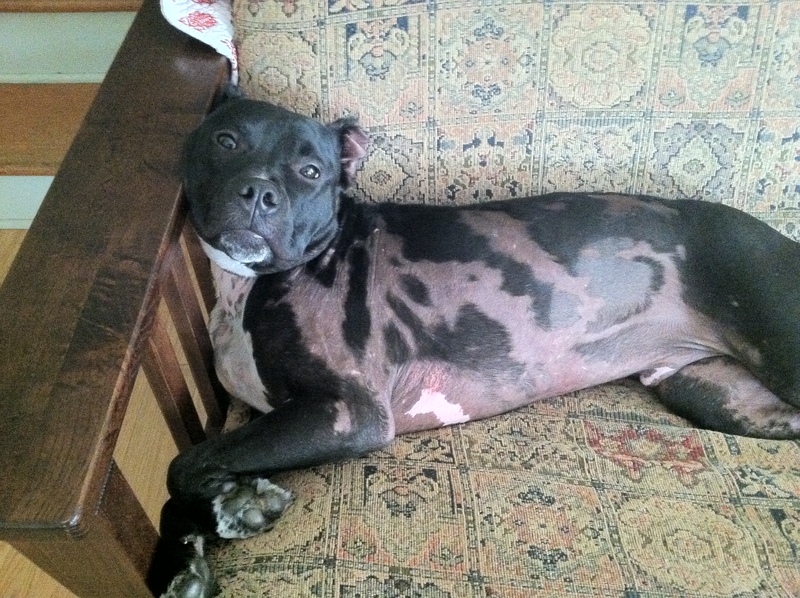 Hercules has become an ambassador representing why animal cruelty needs to end. He also represents why the new Drexel University and Pennsylvania SPCA partnership is so important. The partnership is one of the signature initiatives of the SPCA’s education programs designed to improve the well-being of Philadelphia residents and change community norms regarding the treatment of pets. At Drexel, the collaboration is part of programming offered through the University’s recently established Dana and David Dornsife Center for Neighborhood Partnerships, a unique “urban extension center” that draws on the Drexel community and their partners to provide a wealth of resources to residents of West Philadelphia. The Center will be located on a site that includes two historical properties and a former school, totaling more than 29,400 square feet. Hercules in his new home. Through the collaboration with Drexel, the Pennsylvania SPCA will pilot an array of programs that will focus on: teaching youth to be ambassadors to the community, educating others about the organization’s mission to end animal cruelty and how they can help; improving the health of animals by providing access to affordable veterinary care and education on responsible pet ownership; and strengthening the bond between people and their pets. The first pilot program began in Mantua this summer when the Pennsylvania SPCA partnered with Girls, Inc. to offer an experiential leadership program for middle school-aged girls. The program helps girls to build leadership skills and create lasting social change through community action projects. Over the course of 12 sessions the girls learned the importance of treating animals humanely, developed team building and leadership skills and gained awareness of animal cruelty. During the last two weeks, the girls worked together to develop their community action project. The girls created a board game, Animal Life, which features true/false statements designed to teach other children about the importance of taking care of animals and how they can prevent animal cruelty. The game will be displayed in the Dornsife Center when it opens after renovations. Plans for a second pilot are underway and the story of Hercules will continue to inspire a stance against animal cruelty. The detailed story of Hercules and the collaboration between Drexel University and the Pennsylvania SPCA was recently featured in The Latham Letter, a publication of The Latham Foundation, an organization that promotes respect for all living things. To read the full story authored by Lisa Lunghofer, PhD, of Making Good Work, LLC, visit: The Legacy of Chloe and Hercules.